Nobody is sleeping on the Indiana Pacers now. Considered a team that "snuck up" on everyone because of their underdog status, the Pacers came into the Quicken Loans Arena and sucker-punched LeBron James and the Cavaliers stealing home court advantage in the process. Fool me once, shame on you. Fool me twice, shame on me. The Pacers will not back down against the Cavs. The Pacers' blowout win means they are now 4-1 versus Cleveland (5-1 ATS on the road) in their last few games. But it wasn't Cleveland's porous defence that doomed them: it was their offence. The Cavs only shot 38.5 per cent including only 23.5 per cent from three. They also committed 17 turnovers (Indiana had 11) and were outscored 18-10 on the fastbreak. Cleveland will have to find a way around Indiana's perimeter defence and shoot better. Victor Oladipo scored 32 points including six threes and was +21. Thaddeus Young's perimeter defence paid dividends and despite only scoring seven, he was a game-best +23. The Pacers will continue to lock down the Cavs and force them into taking contested shots. James dropped a triple-double with 24 points but it was a lackluster game for the King. The Cavs will play better in this game but with betting still going their way, fade the public and take the Pacers to cover +8.0. This should be a closer game than the first and while Cleveland should take this, it will take a herculean effort from James and hot shooting to bury Indiana. The Utah Jazz were so close yet so far last Sunday in Oklahoma City. The game played out like a true four versus five seed with the Thunder eking out an eight-point victory thanks to Paul George. The star forward was en Fuego with 36 points including hitting eight of his 11 three-point attempts. Russell Westbrook added 29 but George's hot shooting was the difference-maker. The teams were identical in the box score, field-goal wise though OKC won the three-point battle. The Jazz, however, dominated the paint scoring 50 of their 108 points within the key. Super rookie Donovan Mitchell led the way with 27 points. Point guard Ricky Rubio only shot 27.8 per cent from the field and will need to find a way to get Westbrook to work on defence to slow him down. Despite the Jazz's offensive dominance in the paint, OKC won the rebounding battle 46-42 and had 19 second-chance points to Utah's 10. The Jazz frontcourt of Derrick Favors and Rudy Gobert will need to assert themselves more while Joe Ingles needs to stay out of foul trouble and put on a better performance. 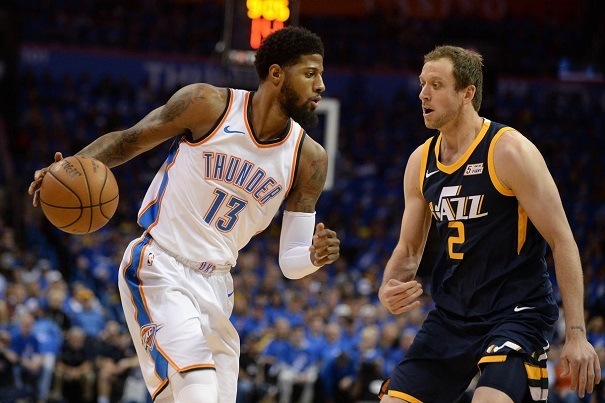 Utah has lost five straight in OKC and is 1-5 ATS but expect their second-ranked defence to make the adjustments, contain George, and limit OKC's three-point shooting while asserting their own. Game one was a wake-up call for the Houston Rockets who, outside of MVP candidate James Harden and big man Clint Capela, shot poorly. This was a Rockets team who led the NBA in three-pointers (15.6 per game) and was the second-ranked offence. Yet they couldn't buy a bucket last Sunday night. The team, outside Harden and Capela, only hit a third of their field goals and only three of their 25 three-pointers. The good news for Houston is, they can't shoot this poorly again. Can they? Credit goes to Minnesota who, despite having only the 24th-ranked defence took Houston out of their game. The Rockets were out of rhythm. But they showed poise and continued to play defence also limiting Minnesota to just 43.8 per cent from the field. Chris Paul will have to play better. The superstar point guard acquired in the offseason had 14 points and six assists but shoot porly (35.7 per cent), committed six turnovers, and was -4. If he gets back into his usual form, Harden wouldn't need to carry the load as much. But if both plays at their usual, this could be the blowout oddsmakers are predicting. The Wolves rose up to the challenge and Houston shot poorly and Houston still came away with a win. Harden proved he's the real MVP with a scintillating 44-point performance on 57.7 per cent shooting. Houston is 1-4 ATS in their last five home games and 10-points is another daunting spread. But consider the first game an aberration and expect Houston to return to their scoring clinic.